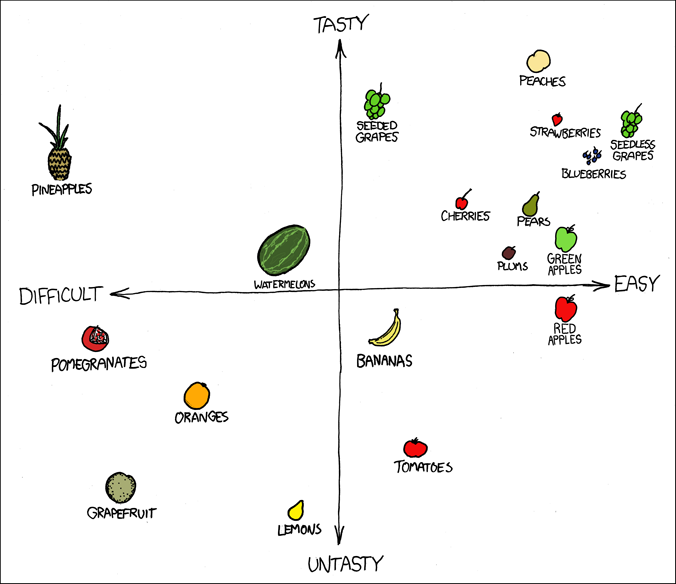 Here's my version of the XKCD fruit matrix. Usually I am always right in tune with XKCD, but this time, I had to take exception to their F*ck Grapefruit comic below. First of all, grapefruit is not a sickly green color. Today's red and pink grapefruit have a beautiful yellow color with a pink blush. So I prettied it up and moved it into the tasty zone. Yes, they are still difficult, but luckily I have a special grapefruit knife which has a curved blade on one end and a double blade on the other end (to cut the skin sections with half the effort). I also had to move a lot of the other fruit around and add yellow apples, my favorite apple. They may be easy for some, but I take the kid factor into account. I still need to peel and cut apples and pears as well as pit cherries before they can be consumed. And have you tried to pit seeded grapes for a toddler? Not even worth it. And bananas are easy and tasty, what happened there? The only fruit I pretty much left alone were pineapples and tomatoes. 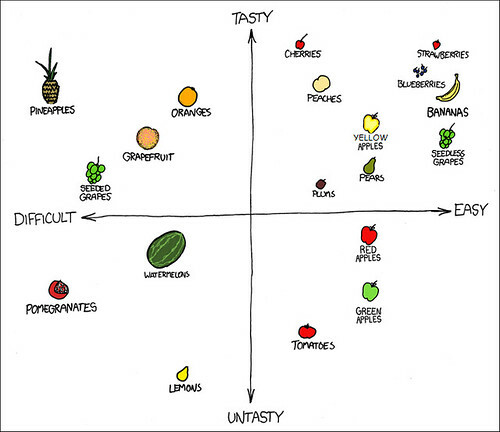 I guess fruit is a rather touchy and subjective subject! I have that same knife. It rocks! Makes grapefruit easy. And I totally agree with your addition of yellow apples. They are a favorite in this house.